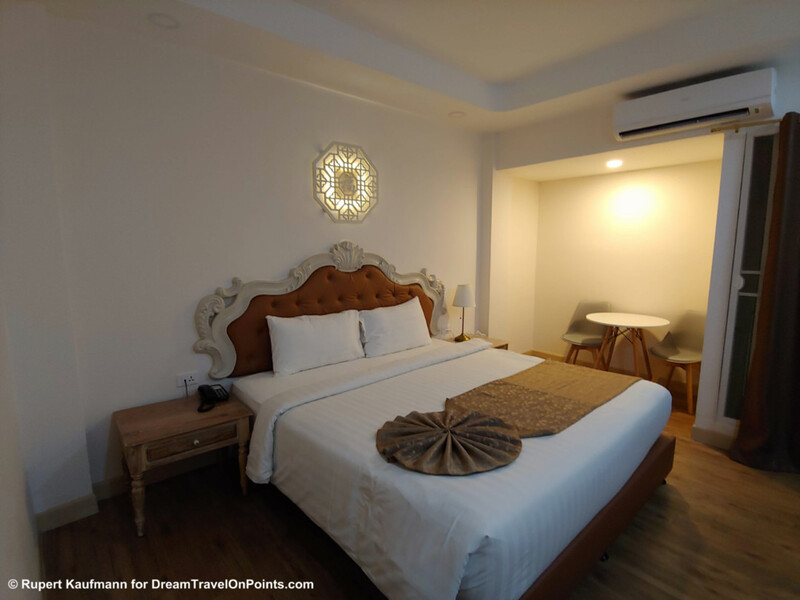 Chiang Rai is a small town, set in the mountains of Northern Thailand, along a quiet river, perfect for a peaceful getaway from busy city-life. 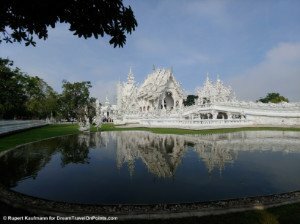 It also offers two of the most unusual temples in South East Asia, with the stunning White Temple and the bright Blue Temple, giving you something to see you won’t find anywhere else. 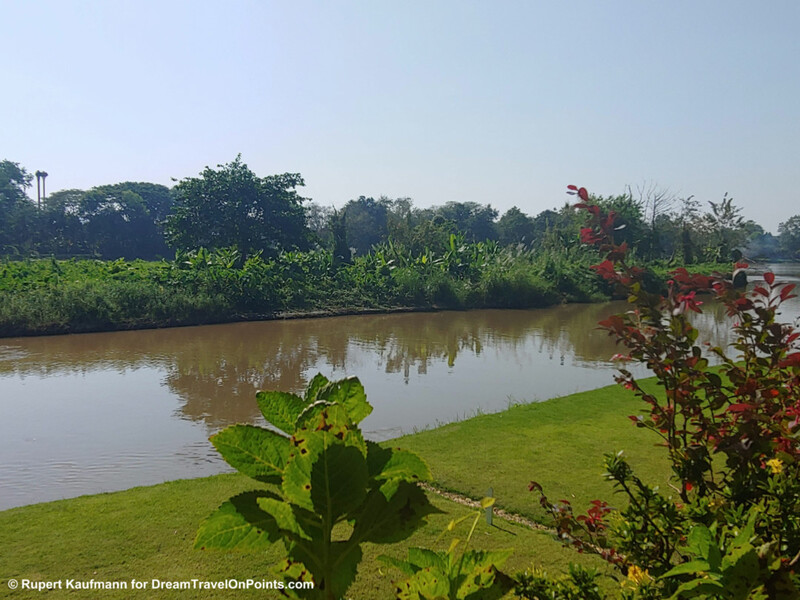 Check out the perfect weekend itinerary for Chiang Rai with the best places to stay, the top things to do and great places to eat and drink! Perfect Weekend Itinerary: After settling into your hotel Friday evening, you head out to the night market. You’ll be fable to find souvenirs made of silk, Thailand’s national animal in all sizes and materials, all kinds of handicrafts and of course all kinds of clothing. You’ll see plenty of choices to eat, from street food to local restaurants to find something to your liking. At the central market square, there’s even some live music for entertainment. 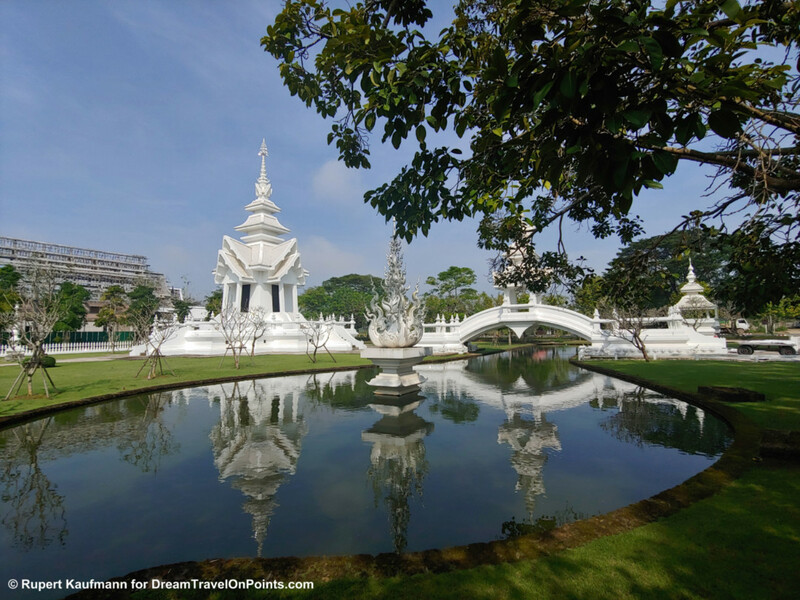 After an early Saturday breakfast, it’s time to see one of the most unusual temples in South East Asia – the White Temple or Wat Rong Khun, ideally before the crowds arrive. 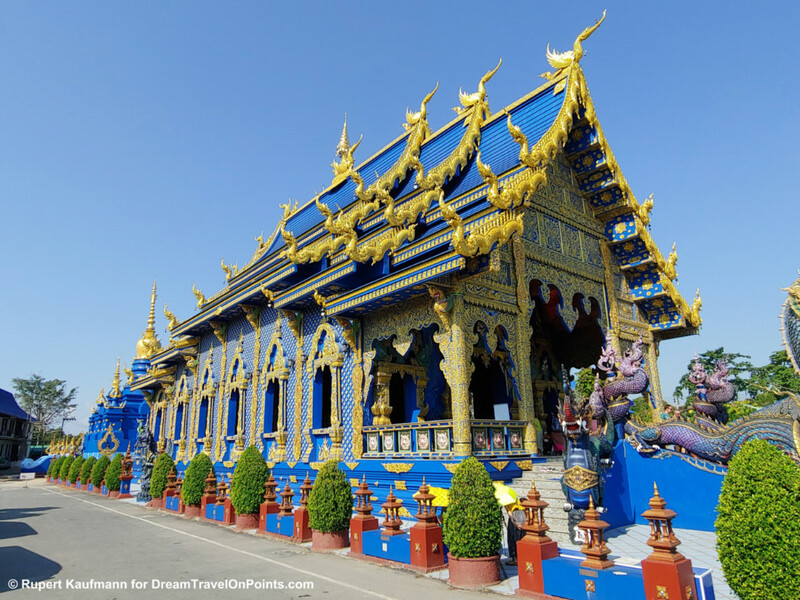 The temple was designed, built and is owned by local artist Chalermchai Kositpipat. The first impression of the bright white and shining temple reflecting in the pond is just stunning – the bright white building has thousands of little mirrors on it, reflecting the light. On closer inspection, you’ll notice some very unusual aspects of the temple. You reach the main building, the ubosot, via the “bridge of the cycle of rebirth”. 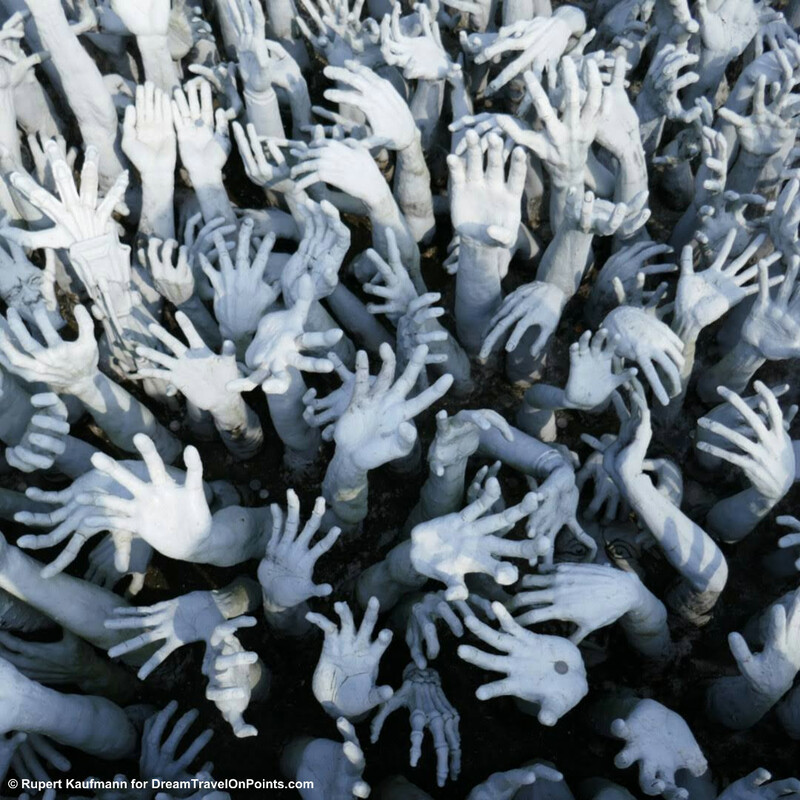 Below you, you’ll see hundreds of hands reaching out to you, symbolizing greed and unrestrained desire. To achieve happiness, you have to leave greed behind – it’s a somewhat unsettling sight…. The temple consists of several buildings, so take your time to explore and take lots of pictures. It’s not expected to be completed until 2070 and eventually there will be additional buildings for learning and meditation, as well as living quarters for monks. One building that is complete is the equally stunning gold building that holds a gallery with works of the artist. If you are not “templed out” yet, head to the Blue Temple, Wat Rong Seur Ten, next. It’s a local temple that – you guessed it – is held in all-blue. Despite its colorful exterior, it’s a more traditional Buddhist temple and makes for great pictures, too. After all that sight seeing, it’s time for a relaxing lunch or afternoon tea break. My favorit spot for that is Chivit Thamma Da. The cafe and restaurant in this beautiful villa on the river offers indoor and outdoor seating with views of the river. It’s one of the most serene settings you’ll find in town and a great place for a snack, a coffee or just to read a book in peace & quiet. Service is fantastic, so you’ll feel welcome and well taken care off! If you enjoyed the night market, go ahead – I’m sure there is more eating and dining to find on your second night. For some local food on a budget, little Smiling Moon Cafe near the night bazaar is great value. 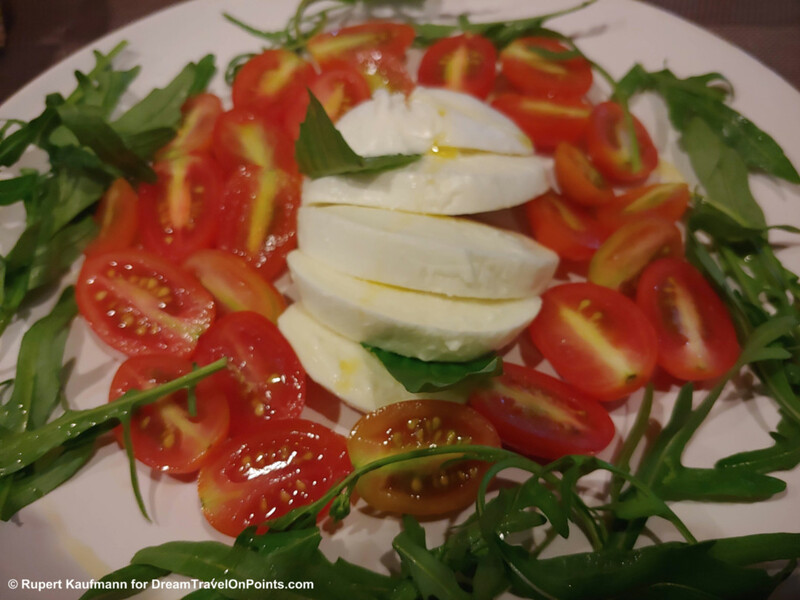 Just across the street Chef Sasa is cooking authentic Italian food – it was so good, I went twice on a single trip! Chiang Rai is the launch point for treks into the mountains to visit the hill tribes. They are minorities from all over South East Asia and China that settled in the surrounding mountains and have maintained some of their historic lifestyle and crafts. While a trek to the villages won’t fit into a weekend itinerary, the small Hilltribe Museum will give you an idea of their history, their life and crafts. You can visit Sunday morning, before it’s time to head back to the airport! 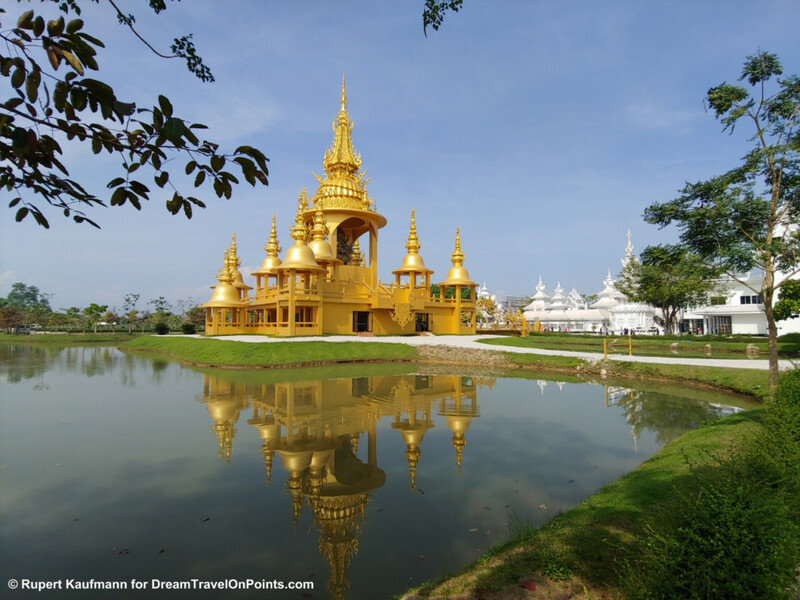 How to get there & around: Chiang Rai has numerous flights from Bangkok, as well as a handful of international flights, for example from Singapore, Hong Kong or Guangzhou. You can also reach it by bus from Chiang Mai, a 3h ride through the mountains! Your best bet to get around Chiang Rai is via grab ride hailing – there are plenty of drivers, it’s cheap and reliable. I rented a bicycle one day and it’s a nice way to explore the river. The town center and night market is best explored on foot! When to go: Chiang Rai’s dry season is from November to March, making it the best time to visit. It gets hotter after that and the rainy season can last from August to October, making sightseeing less pleasant. If you are booking your hotel through a link on my blog, I receive a small commission at no cost to you – thank you for supporting the blog!